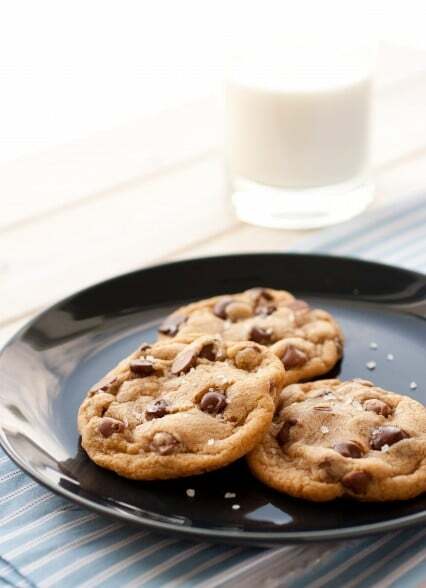 Browned Butter Chocolate Chip Cookies – a delicious upgrade on the classic. 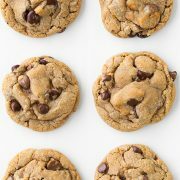 The nutty browned butter adds some depth and the sea salt gives them a fancy flavor and a nice balance to the sweetness. It’s a cookie people of all ages will love! I’ve already posted my favorite chocolate chip cookie recipe, but these are in very close comparison. I never thought it would meet its match. They are two similarly soft and chewy textured cookies, each one with a lead flavor of it’s own. 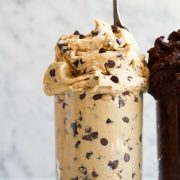 The other recipe I’ve posted is highlighted with flavors of cream (thanks to the coffee creamer powder) and this is obviously highlighted with the gourmet flavor of nutty browned butter. When that brown butter combines in this cookie with the browned sugar and sea salt it seemingly mimics flavors of salted caramel, yes indeed one of my very favorite treats. I did cookie experimenting today with this recipe. I created the base dough and then I added different bonus ingredients (I guess you’d call them). First I stuffed them with homemade caramel – yes delicious but quite messy, second I added pistachios, third I stuffed them with a whole Oreo and last I added dried strawberries. 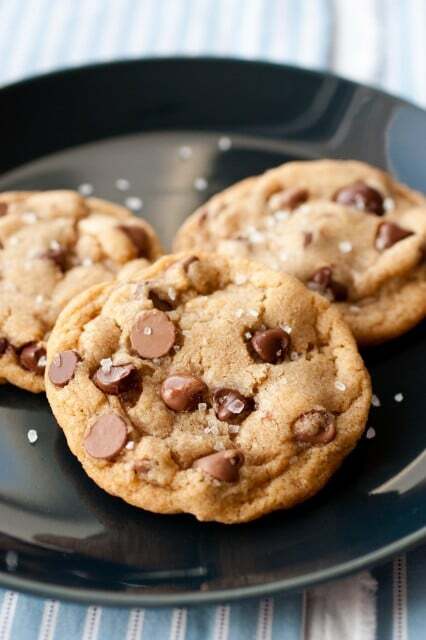 They each had their own goodness but in the end my favorite was the plain and simple, nothing else added browned butter with sea salt chocolate chip cookie. I just didn’t like how the added flavors created a competitor for the browned butter and brown sugar flavor of the cookie. While trying to create something over the top, I realized sometimes over the top is simply sticking to the basics and just trying to perfect it the best we can. Well, here is my idea of a what I’d consider a very close to perfect version of the browned butter chocolate chip cookie. Enjoy! A delicious upgrade on the classic. 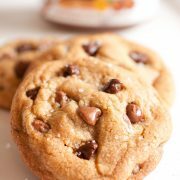 The nutty browned butter adds some depth and the sea salt gives them a fancy flavor and a nice balance to the sweetness. It's a cookie people of all ages will love! Brown butter in a medium saucepan (for a tutorial on how to brown butter see link here, be sure to brown it well enough and also not too long. I brown mine just a bit darker than the picture on the link). Remove from heat and pour into a heatproof storage container, cover with lid or plastic wrap and freeze for 30 - 40 minutes, until cool. In a mixing bowl, whisk together flour, cornstarch, baking soda and salt for 20 seconds, set aside. Remove butter from freezer and pour into the bowl of an electric stand mixer, using a rubber spatula to scrape out any excess. Add light-brown sugar, granulated sugar and vanilla to butter. Fit mixer with the paddle attachment and whip on medium-high speed until slightly pale and fluffy, about 4 minutes. Add in eggs one at a time, mixing after each addition until combined. With mixer set on low speed, slowly add in dry ingredients and mix just until combined (if your dough seems too dry you can add a Tbsp of half and half or milk to help it come together a bit). Stir in chocolate chips. Cover bowl tightly with plastic wrap and refrigerate for 2 hours. Preheat oven to 350 degrees during the last 10 minutes of refrigeration. Scoop dough out about 2 1/2 Tbsp at a time and shape into balls (a bit larger than a golf ball). Drop cookie dough balls on Silpat lined baking sheets (fitting 9 per sheet) and bake in preheated oven for 10 - 12 minutes until golden, transfer cookie dough that isn't currently baking to refrigerator to chill until ready to bake. Remove from oven and sprinkle each cookie with a small pinch of sea salt. Allow cookies to cool several minutes on cookie sheet before transferring to a wire rack to cool. Store in an airtight container.